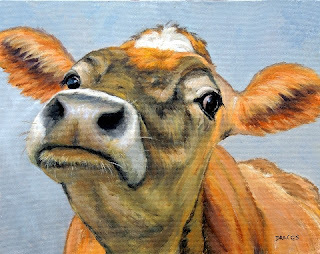 I have finished my group of commissioned cow paintings and am calling the shipper today, so they'll be out of here either today or tomorrow morning. They'll be gracing the administrative offices of a dairy in California. It's been a very long, difficult month, but it's done. I'll be displaying the paintings (seven of them) over the next few days. The first one is below. For those of you who have contacted me about commissioning custom paintings -- or who have already received a response from me, saying I'll be starting your painting(s) in May, I'll be back in touch with you right away to get things started. For those of you who are interested in having a commissioned painting done, I am fully booked for the month of May and am now taking orders for June and beyond. Sorry about the "noise" in the photo; I'll fix it later to remove it. All of the cows I painted in this commission live at a beautiful small farm down near Corvallis, Oregon, about an hour and a half south of where I live. With permission, I went out into the field with them and had a most wonderful afternoon, taking hundreds of photos of them. They were amazingly sweet-natured and very curious about what I was up to. I guess I ought to have been a bit frightened as I was completely surrounded on all sides by them, but they were so calm and friendly that I was totally at ease with them. I know I sound like a "city person," but I'm not. I've spent years and years around horses and other animals associated with farms, but this really was my first up-close and personal encounter with a large number of cows.